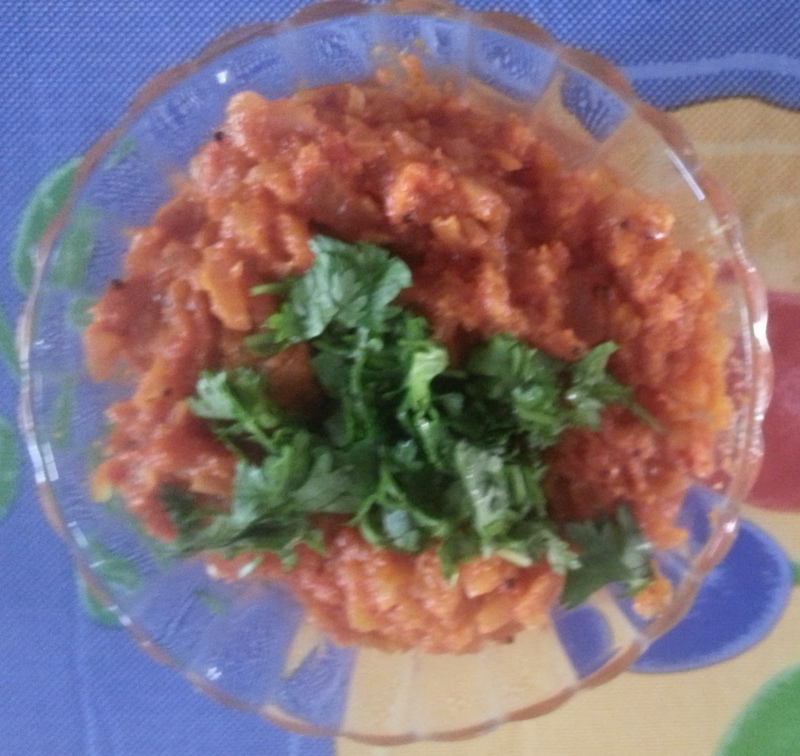 Onion Tomato Gojju is a Side Dish that can be used along with Starters as well as Main Course. Peel the skin of onions and chop them finely. Wash tomatoes and chop them into small pieces. Wash curry leaves, drain the water, separate the leaves from the sprig and keep aside. Heat a medium sized pan or kadai on a gas stove. When hot, put oil followed by Bengal gram dhal, black gram dhal, mustard seeds and curry leaves (in that order). Now put chopped onions and immediately add turmeric and salt. By doing so, onions get cooked faster. Keep stirring occasionally. When onions turn transparent, add chopped tomatoes, tamarind paste and jaggery powder. Stir now and then. At this stage or in the previous stage while onions are getting cooked, heat a small skillet on another burner. Dry fry methi seeds, Bengal gram dhal, Jeera seeds, Coriander seeds, Red chillies and Til seeds (in that order).Whie frying, add a drop of ghee. Let it cool. Grind the above fried ingredients to a coarse powder. Now add raw coconut and continue grinding till they blend well. No need to add water. Transfer this powder slowly by spreading all around over the onion tomato mix that is boiling on the kadai. Mix them gently only on the surface so that the powder doesn’t form lumps. Let the powder blend evenly with the vegetables. After it blends well with the vegetables, stir only occasionally. When you notice the gojju separating from the sides of the kadai, switch off the stove. Transfer it to a serving bowl. Garnish with finely chopped coriander leaves. Onion Tomato Chutney is now ready. Dry grated coconut can also be used instead of raw grated coconut. But it has to be dry fried and mixed with other fried ingredients mentioned above to make powder. If tamarind paste is not available, soak a marble size of tamarind in water for about 10 to 15 min. Squeeze and extract the juice by removing fibre and seeds if any. Use this tamarind juice.